Police say that people caught out by binary options trading scams are losing an average of £26,000. The financial regulator The Financial Conduct Authority (FCA) also warns that last year a staggering £87,000 was lost every day. So what is binary options trading and how do you know if you’re being scammed? Binary options trading is basically financial betting. You don’t buy shares, but instead you bet that the price of a share (or foreign currency – or another asset) will rise or fall by a particular date. So, for example, if you bet that a bank’s share price will rise by a certain date, and it does, you’ll get a payout. If it falls, you’ll lose money. Binary options trading is only for people who are happy (and I mean, genuinely comfortable) with the idea of losing everything they bet. It may be advertised as a sure-fire way of getting a great return but it’s anything but. SAVVY TIP: On 3 January 2018, binary options became a regulated investment product, meaning that all firms trading in binary options will need to be authorised by the FCA. High/low binary options trading: You bet (called ‘taking a position’) that a particular asset will rise or fall by a specified date. One touch options: You take a position that an asset’s price will be above or below certain thresholds. The easiest way to explain this is to give an example. So, say a bank’s share is trading at 200 pence. The thresholds may be set at 240 pence and 160 pence (40 pence above and below the share’s current value). With a one touch option, you bet that the shares will either rise above 240 pence or fall below 160 pence. SAVVY TIP: The price doesn’t need to stay at that level in order for you to collect a payout. The binary options trading company pretends to be based in the UK, when it isn’t. Software may be used to distort the price. SAVVY TIP: Binary options trading may be advertised on social media, such as Facebook and may promise amazing payouts. Some of them have also implied they’re endorsed by Martin Lewis of Moneysavingexpert (they’re not). How much could I lose? You could lose a lot of money if the firm you’ve done the binary options trading through disappears. The City of London Police say that nearly 700 people lost (were defrauded of) an average of £26,000 each, and that’s just in the first six months of 2017 alone. One man lost all his savings – £300,000. There are legitimate companies offering binary options trading. The FCA says that if you are thinking of binary options trading and the company is based in the UK, you should check that it has a current from the Gambling Commission, so it’s able to offer bets in binary options. The problem is that rogue firms can ‘clone’ others so they look like they’re legitimate. SAVVY TIP: I would personally not get involved because I don’t really want to bet my money. I would also never part with my money based on a cold call. In my view, cold callers are either fraudsters, rogues or – at best – keen on the hard sell. Why do business with them? The FCA, has just released a list of unauthorised binary options trading companies. There are over 90 on its list so I won’t include it here. You can see which companies are included on the FCA’s list of unauthorised binary options firms. 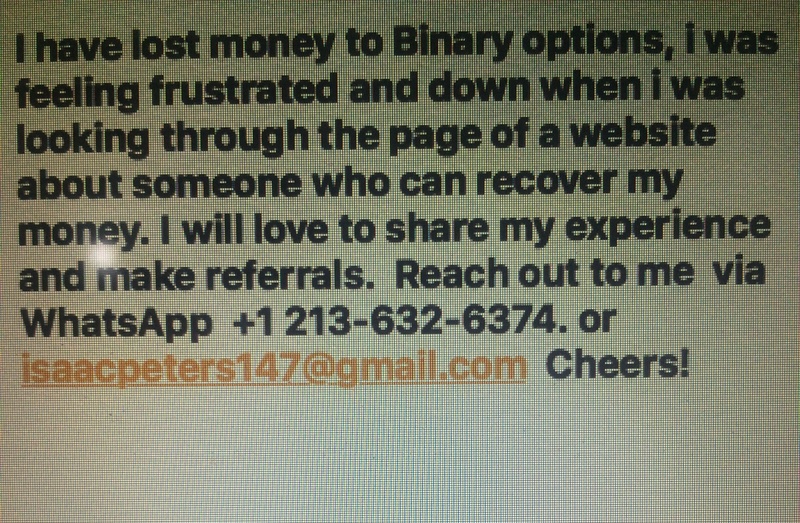 i lost money to anyoptions , but with the help of a recovery expert i was able to recover my money. would be happy to share my experience , you can reach out via gilbertwayne14 at gmail dot com. Thanks to Julius, he’s the best wealth recovery expert I can recommend to anyone who is a victim of binary option scam and other kind of scam; including online ponzhis and dating scam. Contact him on juliusrecoveryexpert@gmail.com . Thank me later. Have you lost your hard earned money through the binary option scam? Do not give up. I have a good news for you. Contact juliusrecoveryexpert@gmail.com . I had doubts it was possible to recover lost funds but big thanks to Julius for helping me recover a huge sum back. I thought someone might need this info. Thank me later.